Butler spent his teenaged years in Libertyville, Illinois, where he was a starting outfielder on the Libertyville High School baseball team that finished in the top 16 teams in the State his senior year. Upon graduating, he announced plans to play baseball in college, and his high school coach, Ernie Ritta, scoffed. Butler, who had explored walking on at baseball powerhouse Arizona State, made the team at Southeastern Oklahoma State University. The outfielder led the Savages to championships during all three years at Southeastern including an NAIA national runner-up finish in 1977. He was twice named to the NAIA All-America Baseball Team. Butler was the Savages' first .400 hitter with a .439 average in 1977. He set career records in home runs (31), runs (209), triples (15), hits (220), walks (162), and career batting average (.394). Following the 1990 season, Butler signed a contract with the Los Angeles Dodgers. 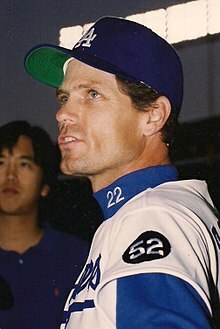 As a member of the Dodgers from 1991 to 1995, Butler reached the prime of his career. In 1991, Butler earned a roster spot on the National League All-Star team, and finished seventh in MVP voting. During the 1995 season, Butler was signed as a free agent by the New York Mets. In August 1995, Butler rejoined the Dodgers in a trade for Dwight Manees and Scott Hunter. After finishing the season with the Dodgers, he again became a free agent and returned to the Dodgers. Over his career, Butler produced a .290 batting average, 2,375 hits, and 558 stolen bases. Many consider him to be one of the best leadoff hitters of the 1980s and early 1990s, due to his high on-base percentage, speed and dynamic bunting. Butler ranks 129th on the list of career hits. [better source needed] Butler finished in the top 25 voting for National League Most Valuable Player five times in his career (1988-1992 and 1994); in 1997, he finished seventh in NL MVP voting and was named an all-star. Butler was a superb outfielder, posting a .993 fielding percentage at center field in his major league career. ^ "Sports Figures". Oral Cancer Foundation. Archived from the original on 2013-12-20. Retrieved 2007-09-18. ^ Hudson, MaryAnn (19 June 1994). "Every Day Is Father's Day : Family Is Close to Dodgers' Brett Butler, Even When It's Across Country". Los Angeles Times. Retrieved 7 June 2015. ^ "May 1, 2006 game recap".